We give you honest answers, no gimmicks and no hassles. We will answer any questions you may have and take the time to show you the different aspects of diamonds and the way they are graded. We have many settings for you to choose from that can be produced in 14K, 18K, Platinum or a combination of those materials. Because all jewelry made in white gold is rhodium plated, we provide one refinish and rhodium plating per year at no charge. Therefore, your white gold jewelry retains the same brilliant luster that it did when you first purchased it. In addition to this, we clean and inspect all jewelry purchased from JH Faske Jewelers for a lifetime at no charge, and as often as you wish. You are always welcome at JH Faske Jewelers. We also have a Diamond Trade-In Program. We give the full amount previously paid for the diamond or diamond studs purchased from JH Faske Jewelers as a credit towards an upgrade of a larger size or quality of higher value. Some minumums may be required. 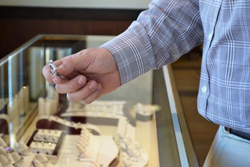 All items purchased at JH Faske Jewelers receive complimentary gift wrapping and upon request, a written insurance appraisal including details and photograph.